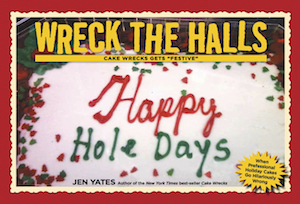 Cake Wrecks - Home - Sunday Sweets Goes To A New Dimension! Sunday Sweets Goes To A New Dimension! Check it out: the rose stem is only painted on the bottom, but transitions to a real one on top! In fact, all the flowers here are 3D. I could swear that smoke is moving! And the flattened perspective on the train? AMAZEBALLS. I love cookie decorations like this! It's almost like a layered paper cutting, or an edible scrapbook page. Check out that sword balancing on the edge. So good. Let's also stop to appreciate the fact that that is ALL BUTTERCREAM, gang. Whaaaaaat. How clever is that painting, so you feel like you're looking IN to the cake? And that sculpted finial is the perfect cherry on top. That braid is the stuff that cakey dreams are made of! Wow. Just wow. Rapunzel is amazing but my favorite is the little blonde girl holding the pink and white balloons. HOW did they make that smoke? Is the next-to-last cake referencing “Beauty And The Beast”? ‘Cause that’s immediately what I thought of. And that first sunflower cake (fourth down) makes me think of a Van Gogh painting. Can’t you just see it with an Amy Pond somewhere? The smoke is most likely a printed image, maybe from here. I’m in love with that second cake. Just beautiful! Wow, trompe-l'œil the cake edition. Did you notice that tiny engineer in the train cake?? I wonder if that is Jaxon? All these cakes are Amazing!!! I'd eat them!! I loved the second cake! It is so elegant, and it is incredible that the baker was able to make the dress pop out of the cake slowly. It is also impressive that they were able to continue drawing of the girl when the tiers change. I love the ribbon on the back of the dress; it was a unique detail.